Mark Diacono specialises in ‘climate change’ crops at Otter Farm in Devon and is also head gardener for River Cottage. 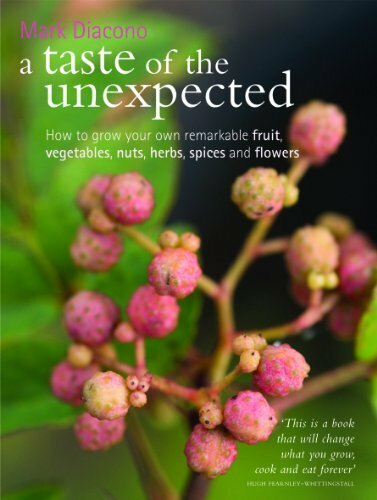 His premise in A Taste Of The Unexpected is that too many of us grow potatoes, cabbages and onions when there is no real need to do so: they are cheap and plentiful in the shops and we could be spending our time and labour on fruit and veg which is unobtainable elsewhere. I think this rather glosses over why people grow the crops they do but it certainly chimes with my own ideas on what to grow. Mark writes engagingly with enthusiasm for flavours and scents – there are some gorgeously sensual descriptions of scrunching up leaves in your hands and tasting the produce . The author also does a good job of making a case for the inclusion of each fruit/vegetable here. It would be too easy to write about crops just because they were unusual. Here each one has to earn its place on the page. Peaches and nectarines, for examples, are included because “unless you’ve grown your own, or had the fortune of being in an Italian peach orchard in the summer, you have yet to enjoy all that a peach has to offer”. Even so I would on the whole have liked to see more on the culinary uses of the produce included here. I feel a bit as though not enough is made of the unique properties of, say, Chilean guava, or Carolina allspice: more is said about how they can be used in place of other more familiar ingredients. I also succumbed to the combined pleasure/annoyance of seeing vegetables I already grow in here. Admittedly a somewhat smug pleasure: Ha! – I already know about romanesco cauliflower , borlottis and globe artichokes too. The annoyance is that I no longer have exclusive bragging rights over the quinces (and look, he has medlars too, s’not fair). Actually I would have found this book useful for the section on kai lan alone. From the description and the pictures, I am certain that this is the same plant that I grow as kaaillan, but Mark Diacono seems to get so much more from the crop that I do (Cut and come again? Survives the winter?). Intrigued, I will be following his growing instructions to the letter this year and will hopefully boost my yield to something approaching his. I also like the fact that guidelines for sowing, care and harvesting are kept concise and simple. And although he makes gardening sound like an easy no-brainer activity, it’s probably not a book for the raw beginner - even though The Directory section gives information as basic as a list of gardening tools needed. I’ll be using this book: it’s made me think about Szechuan peppers and those wineberries, and I think it’s convinced to dump the cabbages as well.